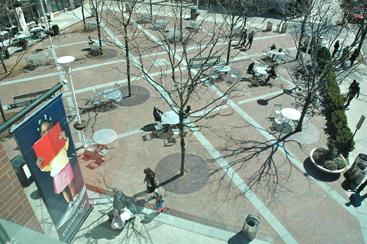 YOUR MOVE: Hinds Plaza resembles a game board in this Sunday afternoon overview, unless you prefer Tic-Tac-Toe. Even if the municipalities did not approve the zoning changes requested by Princeton University to build its proposed Arts and Transit Neighborhood at the intersection of University Place and Alexander Road, the Dinky terminus will still likely move farther away from downtown Princeton. At its Tuesday evening meeting last week, the Board of Education unanimously approved a total balanced operating budget of $73,830,765 for the 2011-2012 school year. Operating under a two percent cap mandated by the state government, this translates as a tax request of $62,190,302 for area residents. After the monthly meeting of the Joint Consolidation and Shared Services Study Commission last week and the Princeton Future community discussion last Saturday, Anton Lahnston summarized the groups progress, and what it will take to get a question on Novembers ballot. Borough Council considered Princeton Universitys proposed rezoning of the region at the intersection of Alexander Road and University Place at its meeting last week. Staff presented their perspective on zoning in the area and gained Borough input while Council members voiced their opinions on future development and the municipalitys relationship with the University. Percy Jackson and the Olympians, Book 1: The Lightning Thief, Rick Riordans popular childrens tale of Greek mythology and adventure, is the theme of this years Princyclopedia, an interactive book convention hosted annually by the Cotsen Childrens Library. The all-ages event will take place from 10 a.m. to 3 p.m. Saturday, April 9, in Dillon Gymnasium. No registration is required for the program which is open to the public free of charge. Utilizing a high-octane offense, the Princeton High boys lacrosse team simply overpowered most of its foes last spring. Mimi Omiecinski is involved in a love affair. It happens to be with Princeton! Happily married with a young son, she is enthralled with the town she now calls home.